Day 1 - It was just about noon when I was escorted by the Montauk Nature Conservancy's trail guide down to the shoreline. The environment was crisp and pure and beautiful. In that moment Montauk lived up to its public reputation. We stood a bit longer and began to talk about the idea of "false truths". The beach had recently been cleaned, when in its truest form it is often littered with objects washed ashore by the currents and the winds. Introduced to the history of the area as I stood looking towards the point, the trail guide said that there used to be a road, "Cliff Road" that mapped the coastline and the old homes that now are holding onto the edge. The cliffs had eroded over time. The road had fallen into the Atlantic. I logged this account with the intent to find "Cliff Road". We continued down the shore, in sand filled with sweeping ruby tones sifted towards the water. The guide mentioned that a geologist who had previously worked with the preserve had informed them that it was the remnants of turned and tumbled granite. If you held a magnet to the sand it would lift the particles up to the surface and onto the magnet. Further down the shore, you could see what remained of glacier deposits; freshwater resources bleeding from fallen kettle ponds heading towards the ocean. Deer tracks, raccoon tracks, and seagull tracks mixed in the printed memory of the sand's surface as each species attempted to drink from the same source. We left the shore by midday and I set out to the local library in hopes of understanding the past and present of what I had just witnessed through a collection of antique maps. Day 2 - It was the early morning when I reached the shore. The previous night in the library had not afforded the discovery of a map of "Cliff Road". 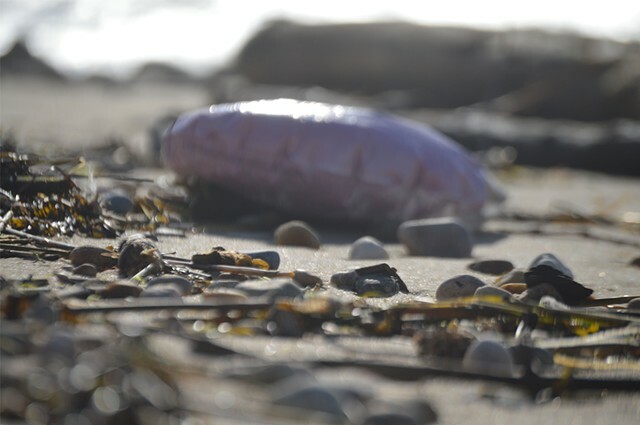 I was, however, able to make a connection with a local Oyster Farmer, who had recently posted a video on their social media account, that by walking the shore after a great "South Wind", the discovery of balloons and waste deposited along Montauk's coast is magnified. I wondered if the shore I saw yesterday, would look different today. What I discovered was a shore in all its truths. It had not been cleaned by the local caretakers. It was too early to build a false truth. I saw a balloon and walked towards it while observing the landscape and the coasts physical erosion. When I arrived at the first balloon and looked down the coast, there was another about 20 feet away. I walked towards the next, only to discover another. Although I intended to study and map the memory of a coastline, I began to understand that I was being navigated in another way of mapping memory. Each balloon held a different record; a different account. Many were from graduations and birthdays. Some were from baptisms, births, mother's day, or notes to family members that passed away. And many were completely withered by all of the pressures that carried them there. They were unrecognizable. They were a transparent distorted lens that I found myself looking through. They were a memory lost. The same pressures that break a coastline, broke the pigment of the mylar. I thought about what brought me to this place. I thought about the latex and the mylar. I thought about the pop of color that marked each point. I thought about Pop. I thought about Warhol. And, I remembered Warhol's "Silver Clouds".